A very robust perennial that is native to the midwestern and southeastern United States. This plant grows to a height of 24 to 36 inches tall with a spread of 12 to18 inches.The large, daisy-like flowers grow on sturdy stems ranging in height from 3 to 5 feet. The flower petals range in color from purple to lavender. The seed center is a large, orange-copper colored cone that is hard and prickly. Blooms all summer and into autumn. Plant in full sun or partial shade. Prefers well drained fertile soil, but is drought tolerant and adaptable to heat, poor soils and high humidity. Maintenance free. Great for cutting and drying. A butterfly favorite. Goldfinches and other birds love to feast on the seeds in winter. 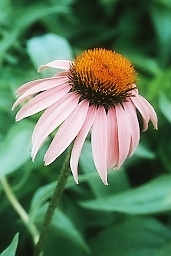 One of the most dependable flowers lending color to a garden, in the height of the summer. Stunning in mass plantings!